You may have found yourself coming to this article because you were hoping for a five bullet point article on how to budget for your wedding dress and the do’s and don’ts of trying on wedding dresses like who to bring with you to your try on and who to leave home. The bad news is, this isn’t that kind of blog. The good news is, it’s better. There are all kinds of wedding blogs out there, and we’re one of them, with great information on what all brides NEED to know before they embark on the wedding planning journey. Let’s face it, most of us planning a wedding are completely new to it and need all the help we can get. But it seems to us that with some brides there is a certain level of apprehension that can take place before trying on a wedding gown, which is why today we’re getting REAL about what you really NEED to know before you try on your first wedding dress, no bullet points needed. Let’s face it, putting on the coveted white gown can be a lot of pressure when you aren’t exactly comfortable in your own skin. Many women start a diet as soon as they get engaged because they want their bodies to be “wedding day-ready”, but what if we stopped thinking like that? What if instead of going on a juice cleanse to get rid of imperfections we have before the wedding day we just…didn’t? What if there was no wedding diet? What if we realized that our bodies were ALREADY wedding-day-ready just the way that they are because after all, your fiancé loved you and all your curves before you went on your diet. Why change now? Make healthy lifestyle changes and if you aren’t feeling your body with what’s good for it then change it. That’s awesome. But DO NOT look at the girl trying on wedding dresses next to you and play the comparison game. You don’t have to look like her in a wedding dress, you just have to look like you! Before you go try on wedding dresses, do your hair, do your makeup, feel confident, present the best version of you and feel amazing in every dress you try on, even the ones that make you look like a cake topper. Embrace this moment and cherish it for what it is, don’t plague this day with voices in your head saying you aren’t skinny enough for that dress. 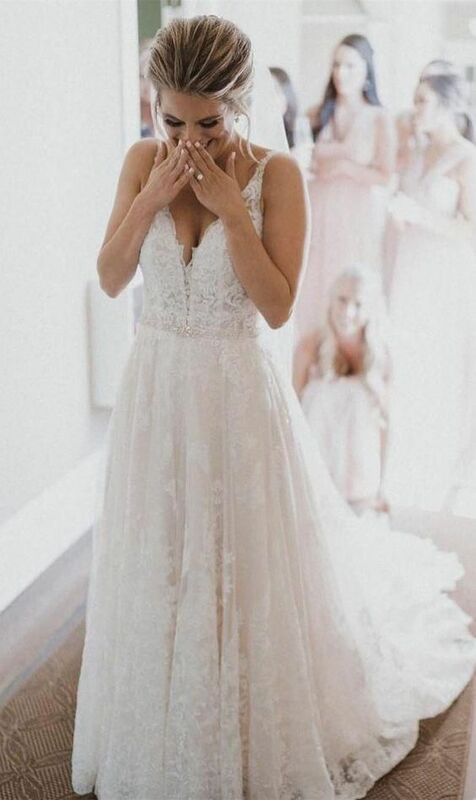 Soak in this day with positive affirmations and when your maid of honor tells you that you look incredible in a dress, take the compliment and believe it. Don’t let those insecurities you’ve had since high school get in the way of yourself feeling absolutely radiant in every dress you try on. Life is too short to let those things get in the way of special moments like this. If you do anything to prepare for wedding dress shopping, prepare your heart and mind to love the skin you’re in. Be kind to yourself, challenge yourself the week before to look in the mirror and tell yourself the things you like, not the things you don’t like. When you step out in that strapless sweetheart neckline gown for the first time, don’t criticize how your arms look and don’t make yourself think you need to cover them with sleeves. If you love the dress that’s what matters. Wear the dress you’re comfortable in but don’t let your insecurities keep you from trying on a style you love. Your fiancé will be blown away by whatever dress you pick out. Ultimately when you find the dress, your beauty will move others to tears. And when you find that dress that you feel stunning in and you start welling up with the water works, embrace that moment of utter happiness and beauty and do not forget what it feels like. You were just as beautiful without the white dress, but the dress ain’t nothing without you.